Mohammadi, S., Mohammadi, E. (2018). Robust portfolio optimization based on minimax regret approach in Tehran stock exchange market. 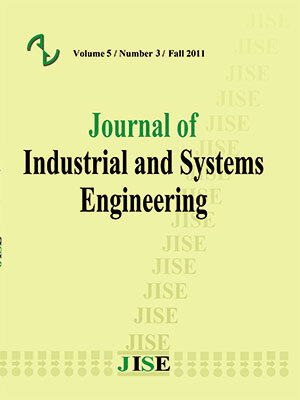 Journal of Industrial and Systems Engineering, 11(Special issue: 14th International Industrial Engineering Conference), 51-62. Seyed Erfan Mohammadi; Emran Mohammadi. "Robust portfolio optimization based on minimax regret approach in Tehran stock exchange market". Journal of Industrial and Systems Engineering, 11, Special issue: 14th International Industrial Engineering Conference, 2018, 51-62. Mohammadi, S., Mohammadi, E. (2018). 'Robust portfolio optimization based on minimax regret approach in Tehran stock exchange market', Journal of Industrial and Systems Engineering, 11(Special issue: 14th International Industrial Engineering Conference), pp. 51-62. Mohammadi, S., Mohammadi, E. Robust portfolio optimization based on minimax regret approach in Tehran stock exchange market. Journal of Industrial and Systems Engineering, 2018; 11(Special issue: 14th International Industrial Engineering Conference): 51-62. Portfolio optimization is one of the most important issues for effective and economic investment. There is plenty of research in the literature addressing this issue. Most of these pieces of research attempt to make the Markowitz’s primary portfolio selection model more realistic or seek to solve the model for obtaining fairly optimum portfolios. An efficient frontier in the typical portfolio selection problem provides an illustrative way to express the tradeoffs between return and risk. With regard to the modern portfolio theory as introduced by Markowitz, returns are usually extracted from past data. Therefore our purpose in this paper is to incorporate future returns scenarios in the investment decision process. In order to representative points on the efficient frontier, the minimax regret portfolio is calculated, on the basis of the aforementioned scenarios. In this way, the areas of the efficient frontier that are more robust than others are identified. The main contribution in this paper is related to the extension of the conventional minimax regret criterion formulation, in multi-objective programming problems. The validity of the proposed approach is verified through an empirical testing application on the top 75 companies of Tehran Stock Exchange Market in 2017. Ben-Tal, A., El Ghaoui, L., & Nemirovski, A. (2009). Robust optimization (Vol. 28). Princeton University Press. Bertsimas, D., & Pachamanova, D. (2008). Robust multiperiod portfolio management in the presence of transaction costs. Computers & Operations Research, 35(1), 3-17. Cornuejols, G., & Tütüncü, R. (2006). Optimization methods in finance (Vol. 5). Cambridge University Press. Dupačová, J., & Kopa, M. (2014). Robustness of optimal portfolios under risk and stochastic dominance constraints. European Journal of Operational Research, 234(2), 434-441. Fabozzi, F. J., Huang, D., & Zhou, G. (2010). Robust portfolios: contributions from operations research and finance. Annals of operations research, 176(1), 191-220. Fabozzi, F. J., Kolm, P. N., Pachamanova, D. A., & Focardi, S. M. (2007). Robust portfolio optimization and management. John Wiley & Sons. Fliege, J., & Werner, R. (2014). Robust multiobjective optimization & applications in portfolio optimization. European Journal of Operational Research, 234(2), 422-433. Ghahtarani, A., & Najafi, A. A. (2013). Robust goal programming for multi-objective portfolio selection problem. Economic Modelling, 33, 588-592. Goldfarb, D., & Iyengar, G. (2003). Robust portfolio selection problems. Mathematics of operations research, 28(1), 1-38. Gülpınar, N., & Çanakoḡlu, E. (2017). Robust portfolio selection problem under temperature uncertainty. European Journal of Operational Research, 256(2), 500-523. Hauser, R., Krishnamurthy, V., & Tütüncü, R. (2013). Relative robust portfolio optimization. arXiv preprint arXiv:1305.0144. Hodges, S. D. (1976). Problems in the application of portfolio selection models. Omega, 4(6), 699-709. Kolm, P. N., Tütüncü, R., & Fabozzi, F. J. (2014). 60 Years of portfolio optimization: Practical challenges and current trends. European Journal of Operational Research, 234(2), 356-371. Kouvelis, P., & Yu, G. (2013). Robust discrete optimization and its applications (Vol. 14). Springer Science & Business Media. Maillet, B., Tokpavi, S., & Vaucher, B. (2015). Global minimum variance portfolio optimisation under some model risk: A robust regression-based approach. European Journal of Operational Research, 244(1), 289-299. Mansini, R., Ogryczak, W., & Speranza, M. G. (2014). Twenty years of linear programming based portfolio optimization. European Journal of Operational Research, 234(2), 518-535. PıNar, M. Ç., & Tütüncü, R. H. (2005). Robust profit opportunities in risky financial portfolios. Operations Research Letters, 33(4), 331-340. Sadjadi, S. J., Gharakhani, M., & Safari, E. (2012). Robust optimization framework for cardinality constrained portfolio problem. Applied Soft Computing, 12(1), 91-99. Savage, L. J. (1972). The foundations of statistics. Courier Corporation. Scutellà, M. G., & Recchia, R. (2013). Robust portfolio asset allocation and risk measures. Annals of Operations Research, 204(1), 145-169. Tütüncü, R. H., & Koenig, M. (2004). Robust asset allocation. Annals of Operations Research, 132(1-4), 157-187. Vassiadou-Zeniou, C., & Zenios, S. A. (1996). Robust optimization models for managing callable bond portfolios. European Journal of Operational Research, 91(2), 264-273.